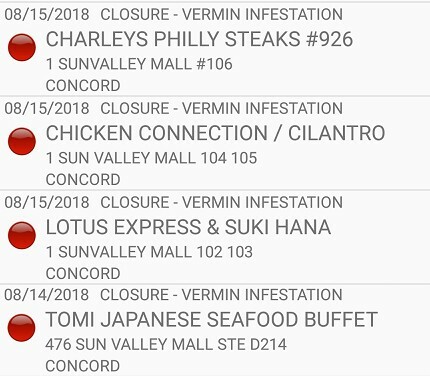 Four restaurants in Concord’s Sunvalley Mall were shut down this week due to a vermin infestation, according to the Contra Costa County Health Department. 10+ fresh rodent droppings observed under food preparation table, utensils sink, and at the food preparation area. Employee failed to wash hands as required. Wiping cloths are not returned to sanitizer solution between uses. 40+ fresh rodent droppings observed under food preparation table, utensils sink, rice containers, and at the food preparation area. Food Adulterated by rodent droppings (rice, flour, and sugar). All food disposed. Rodent droppings inside flours observed. Employee failed to wash hands as required after cleaning utensils. 20+ fresh rodent droppings observed under food preparation table , utensils sink, and at the food preparation area. Employee failed to wash hands as required after changing trash. No metal probe thermometer available for measuring food temperatures. Johnny Rockets, which is also located in the Sunvalley Mall, was closed last week after health inspectors found rodent droppings inside, and also witnessed an employee fail to wash his hands after changing trash bags. Johnny Rockets has since been reinspected and reopened. Click on the ‘dirty dining’ tag below this story to view more restaurant closures in Contra Costa County. Don’t know if many restaurants can afford to be shutdown for short periods of time. Hopefully they all get a grip on their procedures. TOMI can afford it. 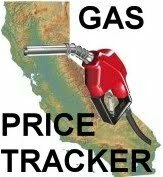 Their prices are RIDICULOUS!!!!! The County has a service called vector control that does deal with these issues, have had them to my residence after construction started nearby and our neighborhood was overrun with skunks, raccoons, opossums and rats. Not sure if this is only a residential service or not though. I agree! We have had a terrible time with rodents in our own yard this year! You can’t buy warfarin anymore, and nothing else works. I feel sorry for people who are getting inspected. It’s pretty impossible to fight an infestation when you don’t have the tools. Rodents are always around. There’s no way to completely eradicate them. But all this does is highlight the fact that these workers are simply not doing their jobs. Rodents wouldn’t be there if there wasn’t an abundance of food supply for them. That means improper nightly cleaning is happening amongst other things. I stopped eating at the food court last year after getting a bad case of food poisoning. It would seem like there is a problem with all of the eateries in Sunvalley Mall. Don’t take the chance. The mall management needs to fumigate the building. Get some decent places to eat at the food court. In Asia if you have a bad food court the mall will fail. You’re saying Sun Valley hasn’t failed already? Haven’t set foot there in years. Place is like a corpse being kept warm for no discernible reason. Gotta stick to food trucks! The rats can’t run fast enough to get on board and if they did they have screens under all food prep areas dropping all rat poop directly onto the ground so inspectors will never find anything! My goodness but it’s been a LONG time since I went into the mall – I didn’t even realize they have a food court again!! Obviously I’m not missing any gastronomic pleasures!! These vermin have been around for a while. Where was the Dept. of Health? I called them about KFC…nothing changed at the restaurant. When I called back, “Inspector” found no problem. So I went back..don’t think he/she did their job. Still was filthy. Maybe they got someone to the mall that is doing the job now. I am eating at home now! No rats at my place! I worked at a restaurant from 16-18. It’s really not that hard to keep the lobby and back of house clean. They need new management, that’s what it all comes down to. I ate at Tomi three years ago. I ate a ton of the raw oysters. I had diarrhea for five days after. Mall Management bears this responsibility. Buck stops with them. Gross, people ate chicken fried in rat poop batter. Tomi was just shutdown back in May for similar problems. These habitual offenders need stricter fines or longer shutdowns until they prove they can keep things cleaned and sanitized. When I worked at J’s Hamburgers and Such in the 70’s all we had we cockroaches and mice. Never saw any rats.